WHO Ghana has donated to the Ghana Health Service, Emergency Reproductive Health Kits (clean delivery kits). The kits are worth over GHS 800 000 and can service about 10 000 women for a period of three months. In a brief handing over ceremony, the WHO Country Representative, Dr Owen Kaluwa mentioned that the emergency kits where originally prepositioned in Ghana for emergencies and have been in store for some time now. However, considering the lifespan of some of the items, permission has been granted by AFRO to hand over the kits to the Service. Dr Kaluwa indicated that these kits would be of great use to health facilities to improve Maternal and Child Healthcare. In this regard, he appealed for the quick distribution of the kits especially to CHPS and District Facilities. He also re-emphasized the commitment of WHO in supporting in the delivery of quality health care services in Ghana. 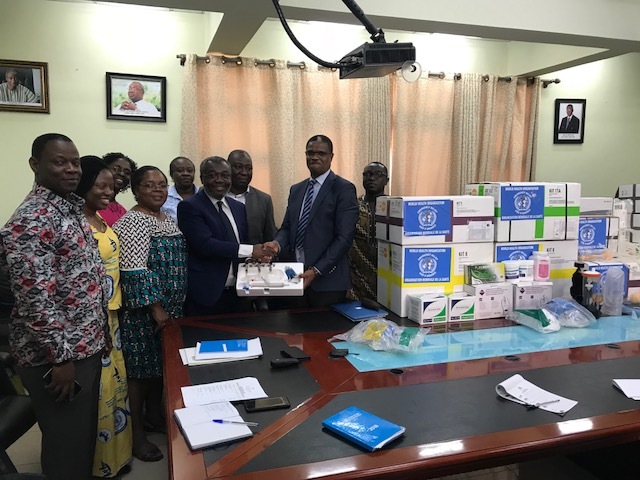 Receiving the items on behalf of the Ghana Health Service, the Director General, Dr Anthony Nsiah-Asare expressed his gratitude to WHO, as this gesture was timely to augment Maternal Health Services delivery especially at the CHPS Centres. He was of the hope that the kits can go round all CHPS Centres that have been set up but not functional because of lack of equipment. Dr Nsiah- Asare solicited for WHO ‘s continuous support to the Health Sector in Ghana.